This season I have been lucky enough to harvest two bucks from my hit list. I ran into a deer we called "Turkey Foot" on October 10th. We named him because of a triple G2 that somewhat resembled a birds foot on his left side. He entered the field I was hunting with another great 8 point and I had a difficult decision to make. The 8 point went by first at 40 yards and I decided to pass and wait for Turkey Foot because I felt he was the more mature deer. Luckily, he followed the same path as the big 8 and presented me with a 40 yard broadside shot. 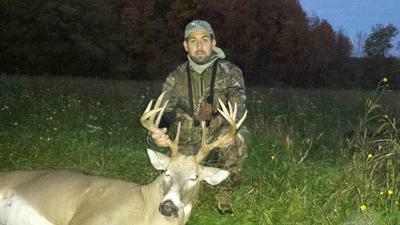 A well placed shot ended things quickly and I was thrilled to have taken such a nice buck with my bow. October 15th as I scanned through my thousands of trail cam pictures I began wondering what had become of the number one buck on my hit list, "DeBo." I had a few dozen trail cam pics of him from the summer and a few random shots early in October then he vanished. No more trail cam pics and no one saw him while in stand during archery season. Had he been hit by a car? Maybe taken by a hunter on a nearby property that I don't know. I hoped that he was just an old smart buck that didn't take many chances. great view and the ability to see so much average. It would be a chance to take some inventory and maybe get a shot at a doe or big buck with my new Remington .270. Around 4:30pm I scanned the field from west to east and picked out a deer headed right at me from about 200 yards out. I pulled up my binoculars and instantly knew that I had a mature buck headed my way. As I examined the buck it didm't take long to figure out which deer this was. I couldn't believe it, the first sighting of DeBo and he was headed straight in my direction. As he got within 150 yards he veered to his right and presented me with a broadside shot. I gave loud enough grunt to catch his attention, settled my pins on his vitals, and squeezed the trigger. I was confident that I had made a good shot as he staggered forward but I wash't taking any chances with a buck of this caliber. I put one more shot into his chest and it was game over. I have been fortunate enough to have harvested a number of quality deer in my life but I was truly shaken after this. I've truly been blessed this season. I'm excited about everything except for the taxidermy bill. My 11 point archery buck "Turkey Foot" scored 140 5/8 inches, weighed in at 225 lbs. and was aged at 4.5 years. My 11 point rifle buck "DeBo" was scored in the low 150's, weighed 220 lbs. and is estimated to be 4.5-5.5 years old.